Criteria are standards with which we evaluate things. For instance: when you meet someone new, you may be using 'honest' as a criterion. Values are very important criteria. For instance: 'Honesty' might be a value when you meet someone new. If they don't seem very happy, you might not worry about that. But if they strike you as dishonest, you might think twice about doing anything with them. Meta Programs are ways in which you handle your values. For instance: are you assuming people will be honest (meta program 'Matching') or are you assuming they will be dishonest (meta program 'Mismatching')? Graves Drives are a typology of important criteria (values). In MindSonar we use them to make it easier to compare a value with other values. For example: is honesty about power for you (the red Graves drive)? Or is it about community (the green Graves drive)? Criteria in that have to do primarily with security and safety. Other keywords for this drive are: belonging, tradition, feeling at home, togetherness, and seniority. Criteria that relate primarily to power and respect—to getting respect in particular, but also to showing respect. Acting impulsively, quickly, and forcefully without thinking of the consequences. Other keywords for this drive are: reputation, power, strength, honour, and courage. Criteria that have to do primarily with order and security. Other keywords for this drive are: discipline, reliability, duty, and control. Criteria that that are associated primarily with competition and winning. Other keywords for this drive are: success, achievement, results, progress, and influence. Criteria that have to do primarily with ideals and loyalty to the group. Other keywords for this drive are: harmony, community, connectedness, love, social contact, and consensus. Criteria that have to do primarily with learning and independence. Other keywords for this drive are: creativity, analysis, and personal growth. Criteria primarily associated with the big picture and a holistic vision. Other keywords for this drive are: responsibility for the earth as a whole, spirituality, balance, and integration. b. Problems with the previous value system. 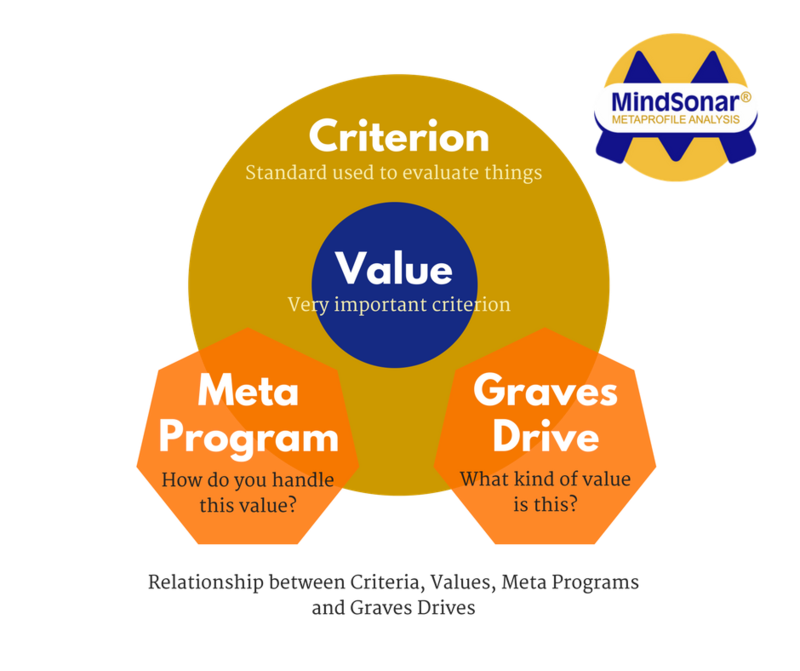 MindSonar measures the extent to which someone's criteria are associated with Graves Drives. We call this Graves categorisation: putting someone's criteria (already formulated) into Graves categories.